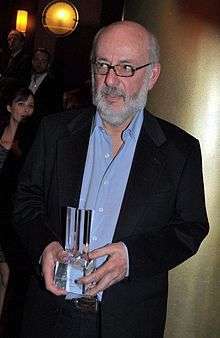 Bertrand Blier (born 14 March 1939) is a French film director and writer. His 1978 film Get Out Your Handkerchiefs won the Academy Award for Best Foreign Language Film at the 51st Academy Awards. He is the son of famous French actor Bernard Blier. His 1996 film Mon Homme was entered into the 46th Berlin International Film Festival. His 2005 film How Much Do You Love Me? was entered into the 28th Moscow International Film Festival where he won the Silver George for Best Director. A defence of Blier's work until 2000 was written by Sue Harris, Queen Mary College, London and published in 2001 by Manchester University Press. With his former wife Françoise, to whom he was married for twenty years, he has a daughter named Béatrice. He also has a son, Léonard, born 1993, with actress Anouk Grinberg. He is married to actress Farida Rahouadj, with whom he has a daughter named Leila. ↑ "The 51st Academy Awards (1979) Nominees and Winners". oscars.org. Retrieved 2013-06-07. ↑ "Berlinale: 1996 Programme". berlinale.de. Retrieved 2012-01-01. ↑ "28th Moscow International Film Festival (2006)". MIFF. Archived from the original on 2013-04-21. Retrieved 2013-04-21. 1 2 "Bertrand Blier". VSD. ↑ "Un Deux Trois, Anouk Grinberg!". Le Soir. Wikimedia Commons has media related to Bertrand Blier.